The Futurity will be held Saturday, October 5, 2019 at the Montgomery County Community College. You will be able to nominate Litters as well as make entries on the USKBTC website under events. The Judging Procedure and 2019 Judging Sheet are now available for download. Simply click on the one you wish to review. There is a change in the scoring this year with hindquarters/tail set being valued at 15 points and movement valued at 15 points. Coat and color are now combined. The 2019 KerryFest Brochure is now available for download. It contains all the information you need to enter the Challenge of Champions, make Hospitality reservations, order T-Shirts, host hotels, etc. Simply click HERE to download the brochure. PLEASE NOTE....FOR T-SHIRTS ORDERS (use the Store), CHALLENGE OF CHAMPION ENTRY, AND HOSPITALITY (Use the Events Section of the Website) WE URGE YOU TO USE THE WEBSITE. LINKS ARE IN THE BROCHURE TO HELP GUIDE YOU. Over the past several months the United States Kerry Blue Terrier Club has migrated to a new website and membership management system. This new system will allow us to serve the membership better and provide many new features such as event entry and member photo albums of your Kerry Blues which can be shared with your friends. Just as important it allows you to maintain your information assuring the very latest contact information is up to date. That way you will not miss a single issue of Blue Prints as the mailing list will come from this new system. Soon you will receive an email which will contain your dues notice for 2019. In that email you will get instructions on how to use the online system to pay your dues and make donations to USKBTC Charitable Funds and other worthwhile UKSBTC activities. To make sure we reach you with this important information we will be posting this email on the website, send it through the new system, post on Facebook, as well as the Google Members Only list. This is a critical first step and we want to make assure you get the information. Please make sure that this email address: webteam@uskbtc.com is cleared through any spam/junk filters…it’s a good idea to add it to your address book should you have any questions. We are all learning and we expect a bump or two in the road. Please be patient as we learn together. Each year we are fortunate to have one of our talented members to create a special print for the Haymarket Futurity. This year Youlia created our print. It is now available in our store under Futurity Prints and Artwork. New USKBTC Website Now Live! 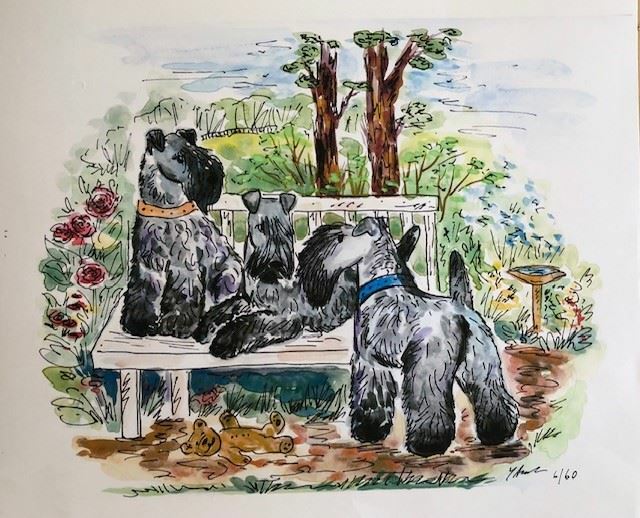 On October 5th at the annual meeting/dinner over the Montgomery weekend, I had the pleasure to announce that the newly designed United States Kerry Blue Terrier website went live on October 1st. This is one of the many accomplishments during Melanie’s time as President of our club. I would like to thank the Communications team – Melanie Feldges, Carl Ashby, Janie MacBryde, Reita Nicholson and Julee Manahan for their countless hours of hard work and dedication that they put into getting this site organized, updated and live! I would like to recognize Carol Kearney for her many years as our club’s webmaster. Carol was the prime mover in the creation of the original website. Carol and Bill put in countless hours adding content and making the website user friendly. We thank Carol and Bill for their efforts. The USKBTC website is more than a website. It is a membership management system that the Communications Committee will be sharing with everyone in the near future. The membership management system will allow all members the ability to update their own contact information and will allow for more administrators of the data on the site. We have added a link to the Historical Archives (being created by Bob and Barb Beuter) as well as an Events calendar. The new website is 90% of the way to completion. The site will be much easier to maintain and update. This will result in more frequent updates and new content being added on a regular basis. While we have worked to eliminate broken links, out of date content, and no longer relevant information there is more work to do. YOU are our proof readers and we have set up an email address for you to report issues. Simply send an email to uskbtcweb@gmail.com. We are looking for content. If you come across an article or have written an article that you would like considered please send that to the same email address. Take a look and navigate around the new website. I hope you like what you see. We welcome your comments and suggestions so send them to uskbtcweb@gmail.com . Member Connie Robbins has made her Kerry SmugMug Albums available for the viewing of Kerry lovers around the world. Connie requests that people refrain from removing her signature on the photo. If you find a photo you'd like a better close up of or would like additional edits please contact Connie directly at cjhrobbins@gmail.com.